Paul Ryan, former Republican vice presidential nominee and House Budget Committee chairman, has a new concern about Obamacare. It comes from a very selective reading of a new Congressional Budget Office report. The report noted that because Obamacare helps decouple health insurance from employment, some people who are working only because of their employer’s health insurance will quit and get their health insurance through a public exchange instead. The CBO estimates that the equivalent of more than two million jobs will disappear over the next few years from employees who can now make this choice. Ryan said this means that Americans will “not to get on the ladder of life, to begin working, getting the dignity of work, getting more opportunities, rising the income, joining the middle class”. This is because, apparently, they will prefer sloth instead because they have the option of getting subsidized health insurance from the government instead. Other Republicans leapt to inferences the CBO never said. The typical talking point became, “Obamacare will destroy more than two million jobs.” As if when people leave their job, employers won’t try to fill those jobs. By this logic anyone who quits their job is destroying jobs. Moreover, last I heard if you quit your job you won’t get free health care. You may be entitled to a subsidy if your income is low enough and if truly destitute and devoid of assets you could go on Medicaid. But that is hardly new. Moreover, employers may be entitled to government subsidies to provide health insurance to their employees. That’s part of Obamacare too. I guess a business could decide not to take these subsidies, but almost all that can will, because they like profits. I don’t see any Republicans referring to businesses that take these subsidies as freeloaders. But people who quit a soul sucking job apparently have no appreciation for the dignity of work and want to be bums. Personally, I think it’s great when people quit their jobs. People don’t quit jobs they like. They quit jobs they hate. So Ryan could not be more wrong. People who quit a job generally expect to find a better and more fulfilling work somewhere else. If they thought otherwise they would stay in their current job. Obamacare increases personal freedom. Most likely everyone will be better off. Employers will get more productive employees that are more vested in their work and those who quit will be (or expect to be) in a happier situation. As for the dignity of work being a personal value, it’s a curious argument for a Republican to make. Right now the situation is reversed. Government gives you incentive not to work, not through health insurance subsidies, but by allowing those with cash to invest their money and tax it at rates far less than the tax rates of labor. Capital gains mean nothing to most of us that are working. We may have retirement accounts with six or seven digits of value, and we still don’t care about capital gains. That’s because capital gains do not apply to our retirement accounts. When, in your geezerhood, you do take withdrawals from your Keogh or 401K, you won’t get a capital gains tax rate of 15% like those moneyed Wall Street types get for their non-retirement investments. That money will be taxed as if you worked to acquire them, i.e. earned income. Only those with liquid assets available for investing outside of retirement accounts can take advantage of those low capital gains tax rates. Others like me are taxed at a considerably higher rate because we work and make a good wage. In my case, I am in the 25% tax bracket. As I noted before, others like Mitt Romney don’t work at all, are filthy rich and are in the 15% tax bracket because their income is almost all from capital gains. If the dignity of work is now an important Republican value, then how about making work pay? People working at Wal-Mart or McDonalds apparently cannot survive on their wages. Many of these people would be malnourished or homeless if they were not getting food stamps or in some cases public housing. If they could survive without government handouts and actually be able to acquire some modest savings and live in their own place, maybe they would feel dignity and value. But many employers don’t care about their dignity or value because they won’t pay them a living wage. What does that say about how employers value labor? Government could set a living wage floor that actually was a living wage. Low income workers would have more money in their pockets and would likely spend most of it, increasing economic activity. Having dignity in your work implies that you can be self-sufficient from your labor. Low wage jobs appear to have the opposite effect. And if work should be valued, shouldn’t it be valued at least as much as investment income? Unless you inherit wealth, it takes a heap of high-paid labor to acquire surplus funds to invest outside of your retirement. The argument for low capital gains tax rates was to spur economic growth. That doesn’t seem to be working so well, as evidenced by our anemic economy and the high unemployment rate. So this argument about the dignity of work is one of two things: rhetoric or, if sincere, it should be a call to action for society to put its money where its mouth is. This can be done by requiring employers to pay a living wage and by increasing capital gains tax rates to at least be at parity with income tax rates. Arguably, capital gains and dividends should be taxed at rates higher than labor. It would demonstrate that we truly value labor. But you already know the answer to the argument: it’s rhetoric. Republicans like Paul Ryan don’t give a damn about the dignity of work or pretty much anyone not in their socioeconomic class and who does not share their values. For those of us in the working class, there is only one appropriate response and it involves lifting your middle finger to these hypocritical assholes. Why is my tax rate higher than Mitt Romney’s? Mitt Romney, the likely GOP nominee for president, is not sure but he thinks his tax rate was fifteen percent last year. We may or may not know in April when he may or may not release his tax returns for 2011. 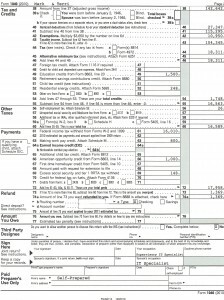 While we may or may not know his 2011 income and taxes, he seems much more reluctant to release tax returns for previous years, particularly when, you know, he was raking in the mega millions working for Bain Capital, where he made his fortune. Mitt wants you to know his tax rate was probably fifteen percent last year because it was almost all unearned income, principally interest and dividends on his investments. This is, after all, a guy who says he knows the pain of unemployment because he is also unemployed. He says that he did have some earned income in 2011, mostly speeches, but it was “only” $374,000 dollars or so. Poor guy. It’s a good thing he doesn’t have to live off just his earned income. Imagine his suffering! First of all, that would place him in the 33% tax bracket (35% is the maximum), which it might mean that instead of flying first class he might have to fly business class. By the way, his 33% tax rate doesn’t mean he paid 33% tax on all of that $374,000. First of all, taxable wages would be considerably less than $374,000, but he would only pay 33% on taxable income over $212,300. Income below this threshold would be taxed at a lower rate. In fact, for his first $17,000 in income, he would only pay a 10% income tax, just like me. Unsurprisingly, my family does not come close to making $326,000 in earned income, but we are reasonably well off. 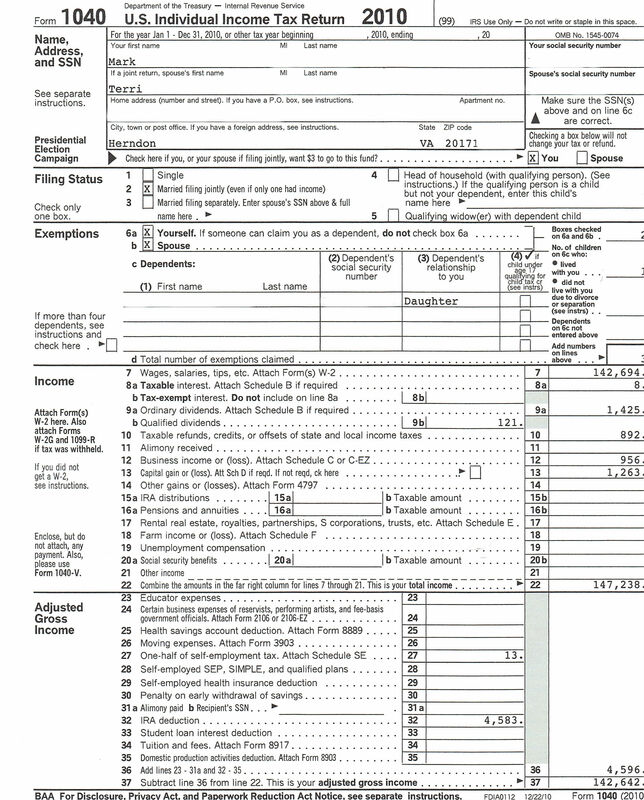 Curious to see how I compared with Mitt, I pulled my 2010 income tax form. 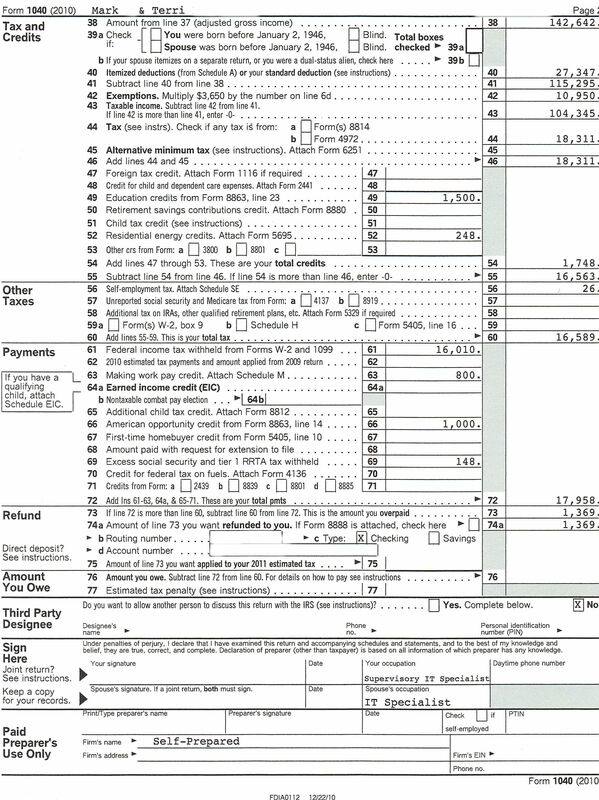 My wife and I fall into the 25% tax bracket, since our taxable income in 2010 was $104,345. Which means that Mitt Romney, whose net worth is estimated at between $190 and $250 million, is taxed at a lower rate than my wife and I. Ten percent lower, in fact. 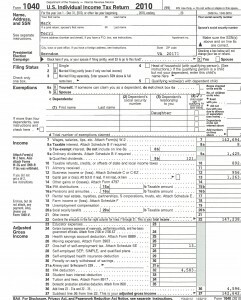 Just for the record, I am releasing my tax returns (well, the first two pages, which is enough), which Mitt won’t do. Naturally I am obscuring some personal information, but as you can see we paid $16,589 in federal income taxes, after some substantial deductions and credits, on an adjusted gross income of $142,642. If you want to understand why the 1% are doing so well and will continue to do well, it’s there is a nutshell. Essentially those who work are required to pay proportionally more of their income in federal taxes than those who don’t, at least if your taxable income is $17,000 or more (using 2011 tax rates). And $17,000 a year is essentially living in poverty. Since Romney has not released his tax returns, we can only speculate about whether he is a shrewd investor or not. Most likely since he spends most of his time campaigning, he is not paying much attention to his stocks and mutual funds. It is unlikely that he is carefully moving his assets around from less productive companies to more productive ones, so that he can build wealth and presumably reward innovation in the economy. Most likely his funds stay largely the same from year to year, or he hires some smart person to manage his funds for him. In any event, regardless of how much he does or does not make on his investments, he pays just 15% income tax on that portion that is over $17,000, and none of it is earned. Presumably he is getting at least 5% interest on his portfolio, so probably this income amounts to no less than $10 million a year in interest and dividends, on which he pays no more than $1.5 million of that in federal income taxes. Whereas I work forty or more hours a week, plus teach a class at a community college for some spare change, plus earn a couple grand with an online business I have. And my tax rate is 25% on taxable income over $69,000. So if you have wealth you can effectively do nothing and pay less taxes as a percent of your income than someone whose source of income is likely almost completely earned and who makes more than $17,000 a year. Is America a great country, or what? Yes, this is a great country, for those with wealth. It’s pretty clear why: because the rest of us subsidize their wealth. It’s not too surprising, if you think about it, that the wealth gap started growing almost as soon as we dropped taxes on capital gains and interest below top tax rates for income, which began during the Reagan Administration. The gap is currently twenty percent: with a top earned income tax rate of 35% vs. a top unearned income tax rate of 15%. To put it another way, unearned income is worth up to 233% more than earned income because it discounts your taxes by that much. Supposedly this policy incentivizes capitalism. It’s proof that the fictional Gordon Gekko was right when he uttered, “Greed is good”. It certainly made him and people like Mitt Romney rich, but it’s clear that the money actually came from somewhere else. In the case of Bain Capital, it often came at the expense of shareholders in failing companies and workers who at best were asked to take a “haircut”, got stiffed on their pensions and/or found themselves out of a job. The plain facts are though that more of the costs of society are being borne by those who have a harder time paying for them. It’s not too surprising then that the wealth gap grows and more and more wage earners are falling out of the middle class. Their value has been discounted. At a minimum, I believe that unearned income should be taxed at the same rate as earned income. This at least sets parity between these two forms of income. Most of us though intuitively understand that value added through the sweat of one’s brow should be valued more than income generated from having capital alone. All value begins with a human being making some physical change to the real world. If anything, these tax rates should be reversed and unearned income should be taxed higher than earned income. Regardless of who wins the presidential contest this year, this inequity isn’t likely to be rectified, but it sure won’t happen if you elect Mitt Romney for president. Instead, you can expect that government for and by the wealthy will continue, and your vote for Mitt will be instrumental in ensuring that the value of your labor will continue to decline.